Ever heard of the ArmaLite AR-10, or more popularly known as the AR-10 rifle? It is basically a battle rifle that feeds in the 7.62x51mm NATO or .308 Winchester cartridges. That being said, I’m sure you have very well heard of the popular AR-15 rifle (you should, after all the deadly mass shooting tragedies that happened in America over the last few years). A receiver is a firearm part that has different serial numbers, where these serial numbers play an important role so you are able to buy your own firearm. Apart from that, the receiver’s main job is to house and assemble the firing parts on the upper and lower receiver (lower only carry serial number). The lower part attaches to the barrel, magazine, stock, pistol grip as well as houses the fire-control groups meanwhile the upper carries the barrel and bolt. In terms of construction on the other hand, the lower has 3 different methods it is made of, which is the forged, billet and 80% assembled. Before delving further into the top rated AR-10 lower receiver, let’s see the difference between both the AR-10 and AR-15 rifle. Equipped with a solid black finish, the Aero Precision AR-10 lower receiver is designed to accommodate the Gen 1 DMPS 308 components, in particular the DPMS magazine and upper receiver. It chambers in the .308 Winchester cartridge, which is rather common among most Armalite AR10 lower. For your information, this cartridge is slightly larger and longer than the standard AR-15 cartridges (223 Remington), hence why you’ll notice that the mag well is more flared and bigger, in order to accommodate the larger rounds with maximum ease. In terms of assembly, this product is forged with a stripped style. This assembly method is said to be the best because it produces a strong (strongest among the 3 assembly methods) and lightweight product. All in all, it allows you to build a custom-made, large-bore AR rifle from ground-up. Moving on to the quality, it comes with mil-spec dimensions as well as good coating to ensure accurate component interface and excellent quality, therefore contributing to its durability in the long run. The coating prevents corrosion which comes in handy if you frequently hunt with your firearm, especially under rainy weathers. So, what does it mean by mil-spec dimensions? To answer your query, the mil-spec dimensions refer to the buffer tube or also known as the receiver extension. For your information, the mil-spec buffer tube is said to be two hundredths of an inch smaller than the commercial one. It costs a little more than the latter and has versatile options for aftermarket stock upgrades in the future. Apart from that, this 308 AR is machined from the 7075-T6 aluminium, together with a matte black hard-coat anodized Mil 8625 Type 3 Classic 2 finish, which further contributes to its excellent resistance to corrosion. Not only that, it has a solid and integrated trigger guard. The integrated trigger guard is firmer compared to any plastic piece in the market. Its selector markings on the other hand comes with 45, 60 and 90 degrees safety selectors. The selector markings also has an interesting pictogram depicting the safe and fire option so you’ll be well aware whether the safety is turned on or not, at all times. On a side note, this 308 AR lower not only accepts the Battle Arms Development short throw safety selectors, but also works well with the standard safeties. Moving on to the mag well, it is clean with a non-rough and polished surface. That being said, the front part of the mag well is higher than the rear so it is easier to get the magazines inside and seated without having to lift it up and down. The main plus point of this mag well (benefiting from the DPMS style lower) is that it accept the PMAG style magazine. Also, the magazine is flared out quite generously to ensure speedy reloads. Last but not least, the rear takedown pin detent hole is threaded 4-40 which comes in handy to ensure that the set screw retains the takedown pin. Therefore, since the bolt catch is threaded for a screw pin, you will not need a roll pin. In fact, with the threaded feature, you just need to unscrew it, put it in place, screw it back and voila, you’re almost done with the installation. Much to your luck, the Mega Arms Maten offers both the upper and lower receiver together so you can kill two birds with a stone, rather than purchasing separately an upper receiver. In fact, you should know that this lower is ONLY compatible with the Mega Maten upper receiver. That being said, this Maten billet receiver set is an outstanding platform to build a versatile and robust AR 308 rifle, as it is designed to accommodate the widest variety of aftermarket components. Upon purchase, this product includes both the billet machined upper and lower receiver, Mega Arms billet charging handle, dust cover door, bolt release, bolt catch pin and pivot/takedown pins. The bolt comes with a complete ambidextrous feature, which I feel is very user-friendly so you are able to release the bolt from both sides. Speaking about the billet style, it is a lot complicated to make compared to the forged style. The billet assembly consists of a CNC machined metal that is machined and carved from a single billet block to form the lower receiver shape. You can easily make modifications with this assembly style. Furthermore, in terms of design, it is rather impressive and rugged mainly due to the laser-engraved T-numbers on top of the Picatinny rail. In fact, its unique aesthetics stand out for the rest of the rifle on firing line. Apart from that, there is extra metal beefing up the attachment point for the buffer tube so that any potential failure point in the future will be eliminated. On the rear, where the extension goes, there are no holes for the detent and spring because position of the set screws are altered (where the detent and spring are contained). The safety selector on the other hand depicts the fire and safe pictograms for clear visual aid on whether your safety is on or off. The magazine well opening is generously flared meanwhile its internal chamfer aids in quick and easy magazine insertion and reload. The trigger guard is oversized and integrated for enhanced rigidity and strength, not forgetting that it provides plenty of room for your gloved finger. Speaking about the integrated trigger guard, it comes with a set screw instead of a roll pin, for your added convenience. Hence, no extra tools are needed to install it, you just need to screw in the set screw to attach the 308 AR upper and lower receiver securely in place. First things first, you should know that all JMT (James Madison Tactical) lowers are equipped with a machining jig. Made from rigid plastic, the jig has a 3-piece solid construction. Besides that, JMT has great machining instructions so you don’t have to fret about adding modifications and completing the receiver. All in all, it can be said that JMT incorporated its own formula of hybrid fibers and polymers, together with additional reinforcements in high stress areas to produce one of the best product in the market. Since it is only 80% assembled, this 308 AR lower is not considered an FFL item. In other words, since it is not a complete receiver (needs further machining to be done), you don’t need a FFL license to buy it. That being said, the operations that need to be done to this 80% lower are installing the trigger and hammer pin, fire control group, trigger slot and safety selector hole. On a side note, it has an extended upper left mag well box section as well as an upper fire control box section. The tools required for the assembly are drill bits of different sizes and lengths, razor, craft knife, mill, machine vice and other gunsmithing tools, according to your personal preference. You need to drill, file and cut out certain parts of the product to put together the lower receiver. In terms of construction, it is made from polymer80 material. In fact, it can be said that all JMT products are engineered to mil-spec tolerances. Due to it being machined from durable fiber polymer material, you don’t have to worry about it corroding in the long run, as you may find when utilizing an aluminium lower. Furthermore, this Armalite lower is DMPS compliant and comes with the new JMT Gen 2 logo markings. Its unique features also extends to its extended bolt release pin posts. The webbed magazine wells on the left and right side are suitable to accommodate Magpul magazines. Apart from that, the webbing on the mag looks impressive and if you notice, the flare on the mag well is actually curved out rather than a sharp line. The impressive webbing results in it being an excellent support hand grip. Not only that, this product is equipped with a threaded brass insert. Therefore, you can tighten the grip screw down without having to strip the threads. Certain key areas of the lower are reinforced therefore contributing to its durability. Featuring the Gen I pattern upper and lower receiver design, the Black Rain Ordinance receiver set is said to accept the DPMS LR 308 pattern components. Hence, it can accommodate the installation of a variety of aftermarket parts. For example, since it features the DPMS pattern, it accepts the DPMS magazines, particularly the Magpul PMAG .308 magazine. If you’re wondering why the PMAG is so popular sought out, it is mainly because it doesn’t have bent feed lips and is rather easy to clean and reload. Apart from that, this upper and lower 308 AR set are fully machined from the 7075 billet aluminium material as well as matched to produce an ultra-stable and full contact fit without any occurrences of slops or rattles. The 7075 aluminium material is said to be very solid, not forgetting that it has a good resistance to corrosion, thus contributing to the durability of your product. In terms of design and finish, it is available in either a rugged, parkerized matte black finish or a non-guard electroless nickel finish that provides an impressive resistance to corrosion as well as surface wear. The assembly style on the other hand is the stripped AR style, with billet construction. Since it is constructed using the billet method, it might be slightly expensive compared to the ones that are forged. For your information, all the parts in this AR .308 lower are interchangeable except the rear takedown pin, pivot pin as well as bolt catch and release. Moving on to the specifications, this Armalite 10 lower has a 3.9mm (.154”) hammer/trigger pin holes and .275” (6.4mm) takedown/pivot pin holes. However, the bolt catch screw is not included upon the purchase of this product. Moreover, the bolt catch pin hole is threaded without a forward assist, hence you need not use a roll pin to secure both the lower and upper together. In fact, you can simply screw and unscrew the pin, for your added convenience. The lower is also equipped with an integral trigger guard that comes in handy to provide maximum structural rigidity. Not only that, there are pictogram selector markings on the 308 AR lower in which you can select it for safe, fire or 3-round burst firing position, according to your preference. The visual aid via the pictogram selector is a good idea, since you can easily remember and view the selector you have selected. Meanwhile, the flattop upper receiver includes a T-marked MIL-STD 1913 picatinny rail. This Cross Machine Tool product comes in a two-in-one assembly which includes the upper and lower receiver 308 AR set. In terms of construction, it is said to be solid because this receiver is machined from the 7075-T6 billet aluminium material, therefore enhancing its strength as well as corrosion resistance, to further improve its durability in the long run. So, why is the 7075-T6 aluminium widely used? Compared to the 6061 aluminium alloy, the 7075 one is referred to as one of the strongest alloys available. Its enhanced strength and high strength-to-weight ratio is very crucial so that the lower is able to handle the powerful recoil from the firearm. Moving on, it comes with a matte black finish and is hardcoat anodized, giving it a rather rugged appearance. 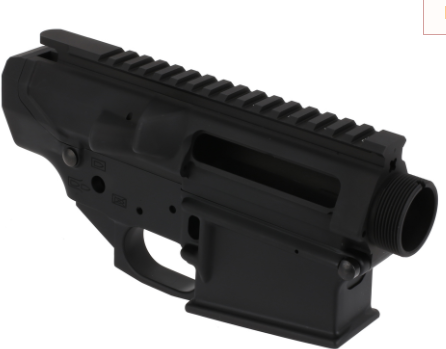 All in all, this upper and lower receiver combination is ideal to produce an AR style .308. Moving on to the rifle build, it utilizes the standard DPMS pattern and components which consists of the bolt carrier groups, charging handle, .308 lower parts and dust cover. The AR-10 upper receiver on the other hand is compatible to fit the DPMS high profile .308 style handguards. Just so you know, it is very important to get the right parts to assemble on the receiver to ensure a tight and secure fit, with minimum gunsmithing required. Get yourself a rifle bipod as well! Based on the specifications, the diameter of the hammer pin holes and trigger in the lower are .154” (3.9mm). Take heed of it so you get the right pair set screws and triggers. Besides that, the bolt catch assembly doesn’t require a roll pin upon installation. Instead, they utilize a hex head screw which makes the installation process a breeze because you just have to simply screw and unscrew them. Furthermore, it comes with an upper tension screw that is built into the lower receiver, in order to ensure that the tightening process of the upper to the lower is quick and easy, not to mention secure. The fit might be a little loose (in my case), from top to bottom but you can always make modifications to rectify the problem. Just so you know, the upper and lower should be tightly secured and aligned perfectly with each other to improve the accuracy of your shot. The ultra-flared mag well featured is wire EDM cut in order to accommodate the PMAG magazines. I love using PMAG magazines because they are solid, without any bent feed lips. Last but not least, this set includes a takedown pin detent spring retention screw and has mil-spec tolerances. Unfortunately, it comes without a forward assist. This Matrix Arms product comes with a stripped upper and lower receiver combo. Unfortunately for this product, you cannot swap another upper to be paired with this lower. That being said, you can only use this provided upper set for the perfect fit. All in all, it has a great and secure fit. A secure fit comes in handy to ensure proper alignment that results in improved precision when shooting. Don’t get me wrong, this is a solid receiver set for its affordable price, however be prepared to do a little extra work and modifications such as filing, cleaning and drilling to get both the upper and lower to fit perfectly. For example, cleaning the threads are common in order to get the screws to go in smoothly. In terms of construction, this product is CNC machined from the American model MIL-SPEC 7075-T6 aluminium forgings therefore improving its strength and toughness. In order to ensure excellent corrosion to resistance however, the receiver has a premium black anodized finish which will really come in handy if you frequently go shooting during rainy weathers. Apart from that, it is slightly thicker than the other models. As a result of this extra thickness, this product will be a little heavy but the beauty of it is when you’re putting it on a barrel. In other words, the barrel will go right back to where it was after every single shot, for your added convenience. Not only that, this AR receiver features the laser etched T-markings that are engraved along the top of its mil-spec rail. Categorized as DMPS high compatible, it incorporates a slant format which is usually considered as the Armalite DPMS pattern. It is however not compatible with the DPMS curved receiver due to the slant format. Also, the AR-10 lower includes a pivot and takedown pin upon purchase. One of the problem I faced with this lower is the bolt catch pin not threading far enough the pin hole. This is mainly because the pin was larger than the receiver’s hole however, you can make some adjustments by simply taking a sandpaper and filing it to a perfect fit. Last but not least, this Matrix Arms receiver set chambers in the 7.62x51mm NATO round. On a side note, this 7.62 lower accepts both DPMS and PMAG magazines for simple and convenient reloading. Just to be clear, this AR-10 lower receiver uses the similar lower part kit as a regular AR-15 style rifle, with the only difference being the takedown and pivot pins which are slightly larger in size. These pins are oversized to accommodate the wider 308 magazine (since the 308 rounds are larger than the 223). Nevertheless, its assembly is almost similar to the AR-15 style lower. That being said, this lower is rather versatile as it can chamber in multiple calibers from the .22LR to the 50BMG. Apart from that, its size is 30% bigger compared to the standard size, not forgetting that it includes reinforcements in key areas to ensure improved strength. To be more specific, it is reinforced with solid brass inserts at the high stress areas. All in all, this receiver includes a stripped assembly made using reinforced polymer material, with a shiny matte finish. The trigger pin diameter follows the mil-spec dimensions and measures .154”. Moving on, the bolt catch/release of this product came with a threaded pin (in my case) instead of a roll pin which is pretty typical when an AR308 lower is involved. However, the TN Arms uses a standard roll pin so you should check what type of pin you got carefully. Not only that, it has a built-in extended trigger guard. I personally love the trigger guard because it provides ample space, hence you can wear and shoot the firearm with your gloves on. There are some problems with this product, however you should decide how it affects you. The first one (well, it’s not exactly a problem) is that the fit and finish is a little rough, some parts at least. The major problem for me is when I noticed that the hole beside the receiver extension for the buffer retainer (where the pin and spring go into) is drilled at the wrong spot. To be more specific, it’s 16th of an inch too far forward at the front of the lower. As a result of this, it will pose as a problem if you decide to put in an A2 or A1 style receiver extension, because it won’t thread far enough to go in. However, if you’re using a carbine style buffer, you need not worry because threading it won’t be a problem anymore. If you’re a handy person who want to fix the problem above, my suggestion is that you can take a sandpaper and sand off 16th of an inch. Nevertheless, I strongly advise you to use a block sander so you can ensure that it is straight filed. The WMD Guns Beast model presents to you the world’s first AR pattern rifle that is fully coated with their proprietary NiB-X nickel boron coating process. This nickel boron coating is rather unique because it proves to be extremely corrosion resistant. Not only that, it is machined from a solid block (billet) of 7075-T6 aluminium metal and coated with the NiB-X treatment as mentioned above, therefore ensuring its durability in the long run. Wanting to go bigger in terms of size, the WMD Guns developed the .308 WMD Big Beast which consists of a large frame rifle. They did so by taking all the attributes of the 5.56 predecessor as a benchmark and beefing them up to .308. The larger size is required to accommodate the bigger size of the 308 Winchester rounds. Furthermore, it comes with a trigger pin with mil-spec dimensions of .154” diameter. The front magazine well offers great finger grips. In other words, it is shaped and textured to act as a finger rest meanwhile its integral trigger guard has been angled to provide more finger room. That being said, the configuration is as follows; the checkered magazine release on the right as well as the bolt release and safety selectors on the left. Besides that, I want to stress on the receiver tensioning screw on the floor of the receiver, located below the rear takedown pin hole as well as on top of the pistol grip. It is basically an adjustable Allen screw with a plastic insert. Also, it plays an important role in applying upward pressure on the takedown pin in order to remove and insert the takedown pin with ease, while still keeping secure and tight fit between the upper and lower receiver. The AR-15 was built based on the AR-10 design, but was designed to be smaller and lighter. In terms of appearance, both rifles look almost similar, but they obviously differ in many aspects with the first difference being the caliber used. The AR-10 firearm chambers in the 308 caliber ammunition meanwhile the latter chambers in either the .223 Remington or 5.56mm NATO caliber. If you compare the sizes of both calibers, you’ll notice that the 308 is a lot bigger compared to the 223 caliber. Due to the heavier mass and bigger size, the projectile stores massive kinetic energy that will be translated into excellent knocking power on the target. Therefore, you can imagine at the back of your mind how powerful one shot from the AR-10 will be! Moving on, there are more differences than meets the eye, which goes beyond than just the caliber or cartridge. The parts of the Armalite AR-10 rifle is slightly larger because it chambers in the larger caliber. Due to the size difference, some of the parts of receiver are not interchangeable, particularly that of the lower receiver. They include, the pistol grip, bolt catch, takedown pins and magazine. In the case of the magazine wells for example, the larger size of magazine for AR-10 ensures that they can accommodate its larger bullet size conveniently. Conversely, the parts that can be interchanged are the trigger as well as trigger springs. Next on the list, we will look into the difference between the DPMS and Armalite series, which are the two main AR-10 patterned firearms. Unlike the AR-15, the AR-10 firearm has no standardized platforms. In other words, they aren’t standardized for construction in which the lack of standardization resulted in the market open for various interpretation and ideas. At the end of the day, there were two main different platform configurations that stood out above the others. These platforms are the Armalite AR-10 series and DPMS LR308 series. Because it is not standardized and of different patterns, the parts of the rifle are not interchangeable. In fact, if you notice, there are two different barrels and even upper receivers designed for both the AR-10 platforms. If you choose a certain one, you’ll have to further select other gun parts that are compatible with it. Next, check out the details about the 3 different construction styles of lower receivers. The forged style is rather popular, it is listed as the most common type of style in the market because it produces the strongest product among all 3 construction styles. So, how is the receiver made using this method? To answer your lingering question, a piece of metal, be it steel or hot aluminium is molded and hammered to take the shape of a standard lower receiver. It is then heat treated to ensure enhanced strength and durability. Moving on to the finishing process, modifications are made as the final touch-up. These modifications include smoothening sharp edges, drilling holes and even coating and engraving it. All that and voila, your product will be of excellent quality. The billet method to produce the receiver is slightly tedious compared to the forged style mentioned above. In fact, there is a lot of time, energy and workmanship involved in the making of the lower receiver using this method, hence leading to its expensive price. In terms of construction, the metal used is carved as well as CNC machined from a single billet block to form the shape of a lower receiver. In terms of strength, this construction style produces a weaker product when compared to the forged method. However, it is strong enough to withstand the powerful recoil from the firearm. The plus point of this method is that you are able to make aesthetic changes according to your preference, with maximum ease. 80% assembled? Sounds little strange, don’t you think? It refers to the lower receiver not being fully assembled. In fact, it is only 80% assembled, therefore it is not considered a firearm. Since it isn’t a firearm, you won’t need to get an FFL license to purchase it. This receiver style would be perfect if you’re a handy person, who loves adding, modifying and designing your own receiver, especially from a pre-machined state. That being said, you may need to get yourself extra tools and receiver parts to fully assemble it. Not only that, you should also be well-equipped with technical skills so you properly assemble the product with great precision. Don’t forget to check out the top rated AR-15 lower receiver as well!